adjective: oriental · adjective: Oriental of, from, or characteristic of East Asia: "oriental rugs"
noun: oriental · plural noun: orientals · noun: Oriental · plural noun: Orientals a person of East Asian descent. Opened 1880 by Milt Joyce. Located at the corner of 5th and Allen Streets, it was called "the most elegantly furnished saloon this side of the Golden Gate". 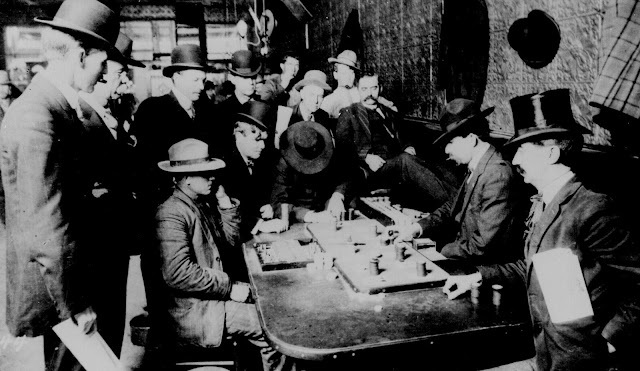 Wyatt Earp acquired an interest in the gaming tables the same year. 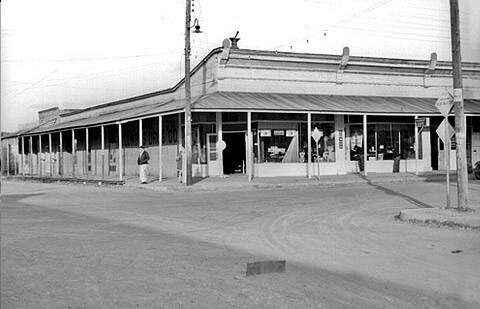 The Oriental became one of Tombstone's most notorious saloons due to several shooting deaths on the front walk. It was "a regular slaughterhouse" according to most. Tombstone's Oriental lives on in infamy and, to this day, is a constant draw for tourists. Little known to most, a different Oriental saloon existed, twenty years later, and nearly a thousand miles away. 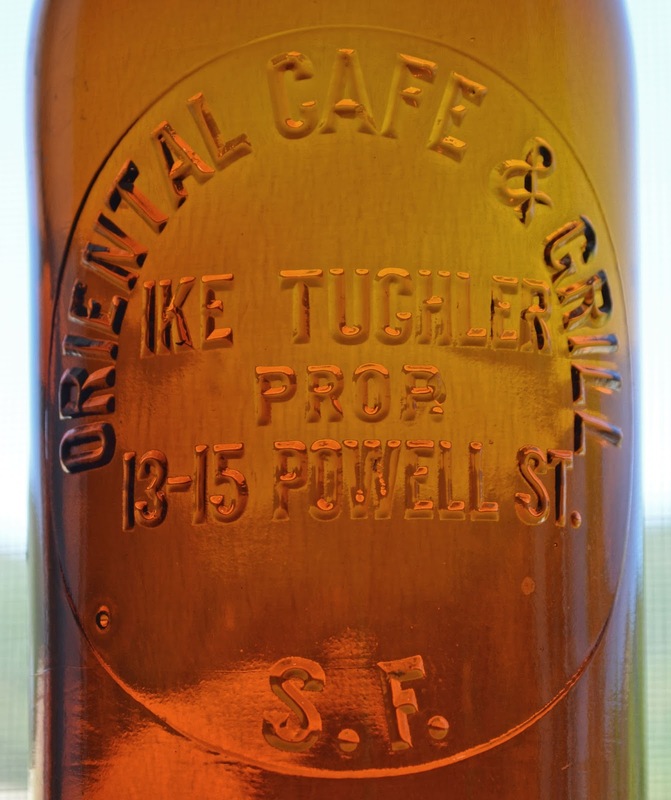 Named under false pretexts, the Oriental Cafe and Grill did a short but thriving business. Isaac (Ike) Tuchler, a native of San Francisco, signed on with the San Francisco Police Department on Dec. 16, 1895, when he was 26 years old. 1900 S. F. City Directory listing. He served the city well, and his "retirement" from law enforcement after just five years of service, on May 1, 1900, didn't go unnoticed. According to the newspaper article announcing his career change, he was a highly commended officer. 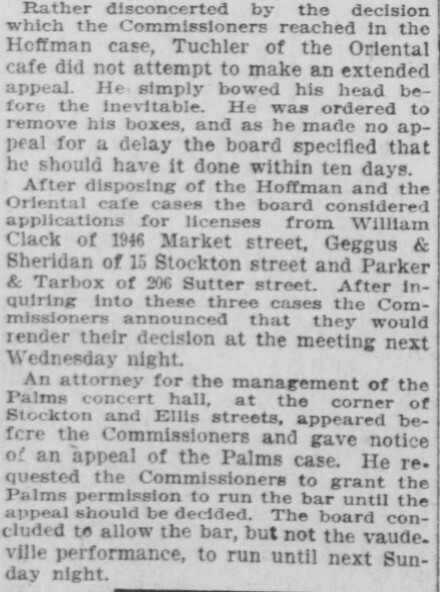 His retirement notice stated that he was going to enter the saloon business at the corner of California and Drumm Streets in "the City". Not being one to let moss grow under his feet, just five days later, on May 6, 1900, he along with his partner A. A. Ranzulo, signed a contract with Weisman and Whittle for the purposes of constructing a 3 story brick building on the aforementioned lot at the corner of California and Drumm Streets, which they already owned. Once completed, sometime in either July or August of 1900, partners Ike Tuchler and Tony "Abe" Ranzulo, (who had previously been with the Coronado Saloon), moved into their new establishment named the "Merchants Inn". The 1901 and 1902 S.F. business directories both list the Merchants Inn partnership at the California Street location. The location was a natural since it was just a couple of blocks from the Ferry building and just a stones throw away from Market Street, the busiest arterial in San Francisco. The photo tells it all. Just head another block down toward the Ferry Building, turn left at the street just past the cable car, and you've arrived at the Merchants Inn. On December 15, 1901 a large advertisement appeared in the San Francisco Call, calling attention to their enterprise. The Merchants Inn had a unique business model. Advertise a large buffet of good food priced at next to nothing, and sell liquor by the drink in the "box" (a large saloon partitioned off from the "eatin' room") next to it. 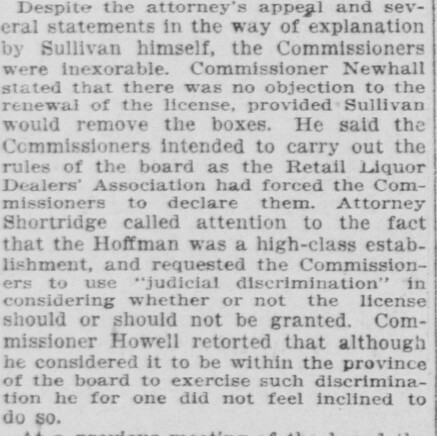 It was a way around saloon licensing and the myriad of ever increasing restrictions that the commissioners were forcing down the retail liquor trades throat in post turn of the century San Francisco. Free food (or next to it) mounded high on the tables brought customers through the doors by the hoards. Sausages, salami, sardines, pickled herring, cheeses, salt crackers and a myriad of other salty foods kept the clientele thirsty and the drinks flowing. It worked! In fact business was so good that Tuchler and Ranzulo stepped to the plate for a private mold amber embossed tooled top cylinder. It's number 548 in Western Whiskey Bottles 4th edition, and it's a pretty tough piece to acquire. All apparently went well... but for only about two years. For whatever reason, Ike and Abe split the sheets in late 1903 and Ike pulled up stakes. He moved to a new location at 13 - 15 Powell St., several blocks (and nearly a mile) uphill from the California / Drumm Street location. Abe continued to run the Merchants Inn, and had a new bottle mold cut for the business. It's number 547, and the embossing pattern is notably different; sans the initials / logo and Tuchler's name. Ike decided that the old business model was worth carrying over. He established the Oriental Cafe at the corner of Powell and Market, and immediately had a bottle mold cut for his new enterprise. The 1903 S. F. directory listed both the Merchants Exchange and the Oriental; but under separate ownership. A large buffet of good food priced at next to nothing enticed hungry and thirsty alike at the new location. And once again, sausages, salami, sardines, pickled herring, cheeses, salt crackers and a myriad of other salty foods kept the clientele thirsty and the drinks flowing. All was not sunshine and blossoms though. Shortly after the doors opened, Tuchler was served notice by the City. The commissioners demanded that both the Oriental, and the Hoffman (another established "lunch room"), shut down the "box" portion of their enterprises. Oddly enough the Merchants Inn was not named in the legal maneuvering. 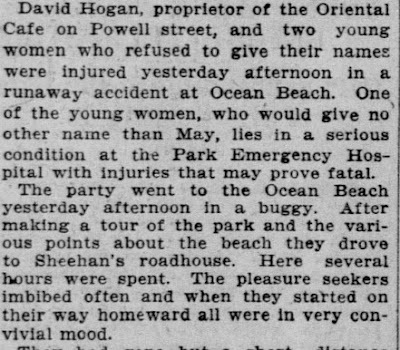 Regardless, the die was cast and the writing was on the wall for the Oriental. Shortly after it opened, Tuchler closed the doors for good. He retained ownership of the business though, and sold it to a David Hogan in 1904. Hogan tried to make a go of it for a couple more years. No embossed bottles are known to exist for his enterprise and April 18, 1906 wiped his slate clean for good. Tuchler, apparently tired of the saloon scene and politics, entered sales. The 1904 directory lists him simply as a salesman. The 1905 directory spells it out a little more clearly; still a salesman, but as a salesman for none other than Hilbert Mercantile. No doubt, his major supplier during his tenure in the Cafe / Grill, and saloon years. It's good to have friends in the right places. To tie it up in a neat little bundle; three of the rarest San Francisco private mold fifths are inextricably intertwined. The Oriental evolved from the Merchants Inn. The Merchants Inn, under Ike Tuchler and Tony "Abe" Ranzulo, lasted three years, give or take; 1900 - 1903. The new mold blown for the Merchants Inn under Ranzulo was also used for three years; 1903 - 1906. The mold for Tuchler was hardly warm when it became obsolete. It was used ca. part of 1903 only. 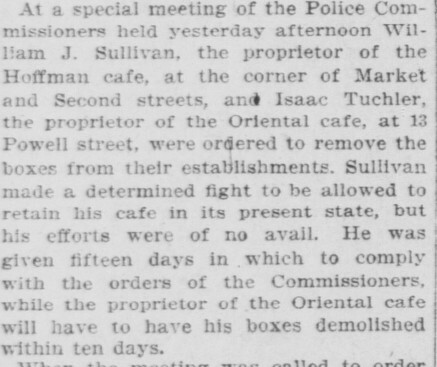 Tuchler's Oriental was forced to close, along with Sullivan's "Hoffman Lunch" in 1903. Sullivan tried to restructure his business under the guise of "The Hoffman Cafe Co." in 1904, but got caught and sold the Hoffman Lunch to Sam Bernard in 1905. Of the bunch, there's no doubt that the Oriental is the rarest bird in this cage. To my knowledge, there's only a couple of examples documented to exist in collections. Both Arizona Territory and the City by the Golden Gate had their Orientals. 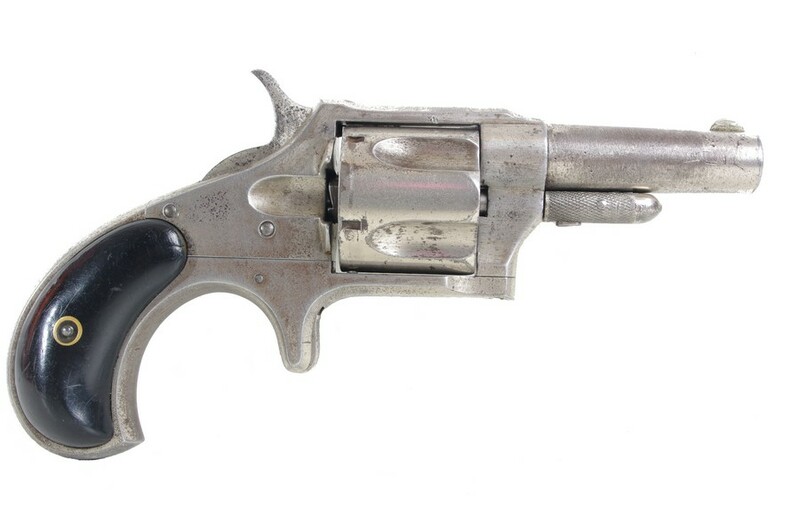 Wyatt Earp may not have dealt faro in San Francisco's Oriental, and it may not have been "a regular slaughterhouse", but it earned it's place in history just the same. PS: The base of the Oriental is embossed 399H. No, Not Holt Glass Works!... This base mark definitively dates this Abramson / Heunisch Glass Co. mold number to a very small window in 1903.